You failed. It happened, and now you can’t stop thinking about it. It’s ok, we’ve all failed before, and guess what, we’ll fail again. But we need to move past it! Here are some tips on how to finally STOP OBSESSING over that time you failed! Time to move on, move forward and get to the next thing. 1. Admit it, but don’t BECOME it. Don’t let that one thing that didn’t go quite right define who you become. You do not become a failure, ever. Admit that it happened, but don’t let it touch who you are. You are a try-er, and these are the things you have to go through to get to the place you want to be! Our self-esteem drops when we decide to become our fails, and that’s not only damaging but it lowers our frequencies and slows down our progress. Nobody wants or deserves that!! There’s nothing good that’s ever come from ignoring our emotions. Figure out how you really feel and put it into words. Do you feel angry? disappointed? sad? It’s all ok, and guess what? It’s all natural! Allow yourself to feel what you feel. Once you do, it’s time to move on. 3. Turn it to ashes. Writing something down gets the energy out of your body. Putting your emotions and situations on paper allows you to clear your mind. Truly. So take a moment, and write it down. The failure, your feelings. Put it all out there onto the page. And then, turn it to ashes. Burn the paper and let the ashes fly away and take everything with them. It’s a very freeing moment. You’ve now gotten rid of all these negative thoughts and emotions that were swirling around inside you. Here’s the thing, though, energy lingers. I can’t seem to focus when I have a cluttered space or when it feels stuffy and heavy in the room or in the house. Ever feel that? Like no matter what you did, you still don’t feel quite right? it’s time to clear the negative energy and clean the space around you. Nowadays you can find these things anywhere, but go grab yourself a sage smudge stick and use it. Sage has been used for centuries to clean and purify areas. Make it work even more by saying some positive thoughts as you do this, or pray, whatever you’re into. 5. Let go of other’s opinions. Sometimes, when we’ve failed it isn’t so much the failure that we get really anxious about, it’s when it’s a public failure. When people know. What will they think now? Deep down we all have this fear of not being respected or believed in, and failing makes us feel less than. But guess what? You’re not the first person to have failed. You’re not the only person in this world that things have not turned out for. 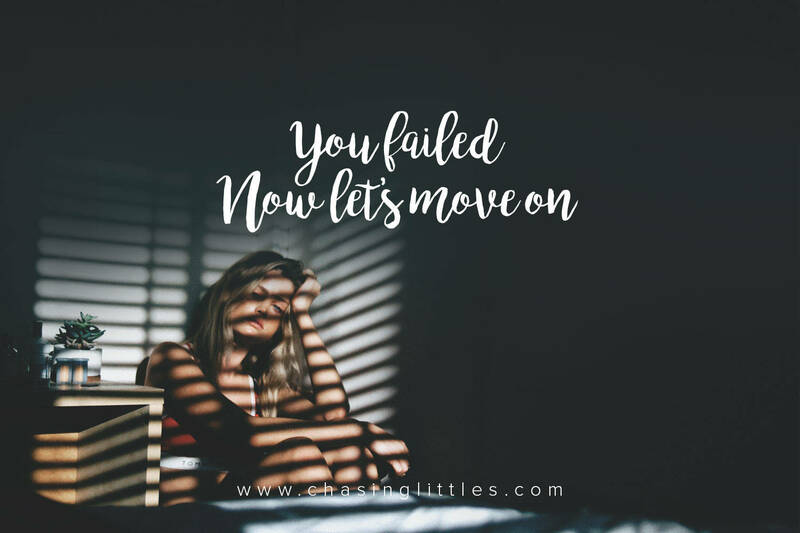 So let go of the care for what other’s think of you because you tried, and somewhere along the way, you will succeed, and that day, you’ll know that it was all your hard work, your dedication, and your drive to stop obsessing about that one time you failed. This post contains affiliate links. What does that mean for you? It doesn’t cost you anything extra but I get a small percentage of your purchase if you decide to purchase something from the post. I do this to make some side income while linking you to the great products I use. I will never write a post about a product I do not believe in, and no one has paid me to write this post. All opinions are always my own. Just like supporting a friend’s small business, by clicking on my affiliate links you are supporting a small time blogger who deeply appreciates it. You can read more about this on my about page. Thanks love. When your friends or family are unsupportive. This is such a nice reminder! As I have been receiving a lot of “no’s” lately and I am just trying to keep those “Positive Patty Pants” on and keep moving forward, working hard, and never giving up. Thank you for this! Thanks for this! I wish you best of luck in all you are doing!! This is a great post. Failure is what helps us grow and makes us stronger. It’s nothing to be ashamed of! Totally agree Nicole. it’s part of the process! Great advice but not always easy to do is it!? Agreed. Every time is a new opportunity. Love this post! Holding on to negative things isn’t worth the energy a lot of times. Great post, I’ve had my share of those moments and you hit the nail on the head with your list of ways to cope. Perfect reminder since I’ve been having a couple bad/stressful weeks! Wish you some less stressful weeks now!! And thank you!! Thank you for reading! I appreciate it and totally agree with you. As entrepreneurs one will fail more often but the rewards are bigger! Great and healthy ways to cope with failing. Time to move on and never give up. Great reminder. Sometimes I get caught up in catastrophic thinking (“I made a mistake” –> “I always make mistakes” –> “I’m the worst!”) and it’s such an awful frame of mind and habit. I’m working on breaking that! We can be so mean to ourselves! Way to work on it! you got this! i have been obsessively thinking about failure and it just ruined my whole week as i was waiting to hear some news. it has not yet happened yet but i have been telling myself – lets move on, it wasnt a good fit to see if it will help. Oh no, I’m sorry to hear that girl, keep your head up!! Great tips! I definitely tend to get caught up with the things that don’t go right, as opposed to focusing on the things that do. Thanks for sharing some strategies to help overcome that! We all do sometimes don’t we? it’s all about being aware! Failure is def a part of life and dealing with it in a positive way is best! I’d like to think that every failure is a stepping stone to success. I like that thinking! Thanks for stopping by! Happy to have you!